Home-grown fruit tastes incomparably better than fruit from shops because you can pick it when it’s really ripe. Boundary walls and fences make ready-made supports for soft fruit (such as berries and currants), or you could train plants over an arch or up a trellis screen. Some types are not too fussy about soil, and they can look stunning when in flower and fruit. Good value for space and taste are: Loganberries and tayberries (which look something like large raspberries), cultivated blackberries (ones without thorns), and the exotic Japanese wineberry with its decorative stems and aromatic fruit; Redcurrants, white currants and gooseberries can all be trained against a fence (although not blackcurrants because of the way they grow). A fork, spade, secateurs, wire and ties for training the stems. Most fruit gives the best yields and sweetest crops in a sunny spot, but redcurrants and blackberries will cope well with a shady spot. Avoid ground that is prone to getting waterlogged. Allow a 60cm width along a 2.5m length of wall or fence for cane fruits (such as raspberries and blackberries), and choose the least vigorous varieties. Redcurrants, white currants and gooseberries can have as little as a 1m spread, and are better behaved so can be grown alongside a path. Dig over a 60-90cm square patch to remove weed roots. Fork in soil improver (from a garden centre). Garden centres often stock some soft fruit in containers. However, mail order seed companies and specialised fruit nurseries have a much better range, and they send plants out in late winter or early spring when it is the best time to plant. 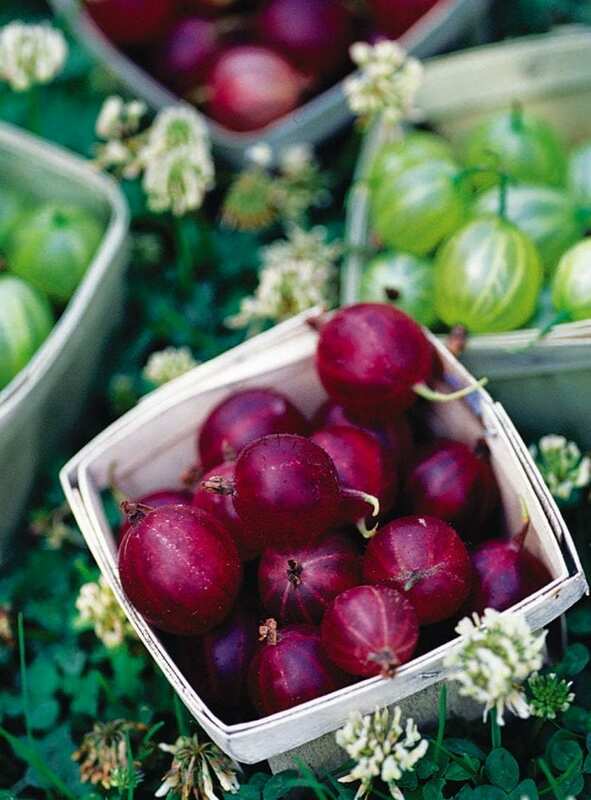 Redcurrants, blackcurrants, gooseberries and blackberries are fantastic in creamy summer and autumn desserts, pies and tarts. Also tart or sharp berries go well with lamb, game, mackerel and smoked fish. Fresh berries freeze well, simply open-freeze on baking trays until solid, then pack into plastic boxes. Berries are great to have growing as you can just pluck a handful to decorate desserts and cakes.